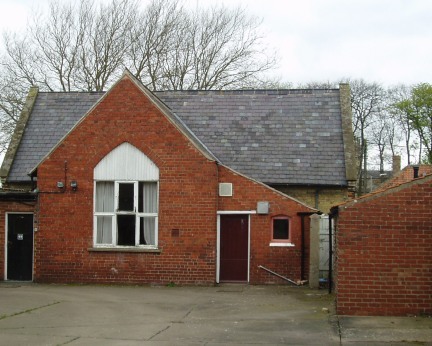 The village junior school closed in July 1982 and was unused till a management committee took it on in 1984. 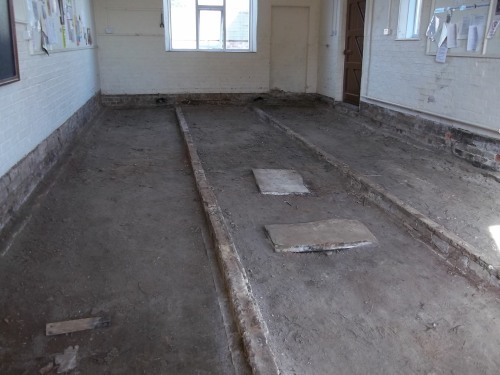 The property was leased from the Lincoln Diosesan Trust for £1 per annam. 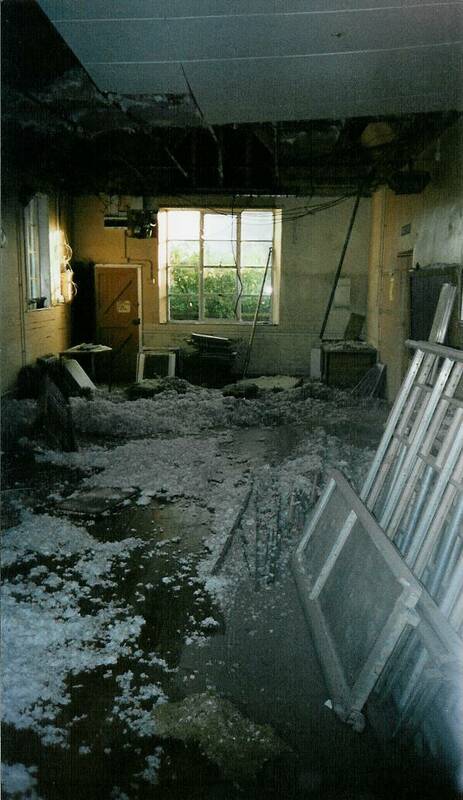 The committee were responsible for the insurance and the maintenaance of the property. 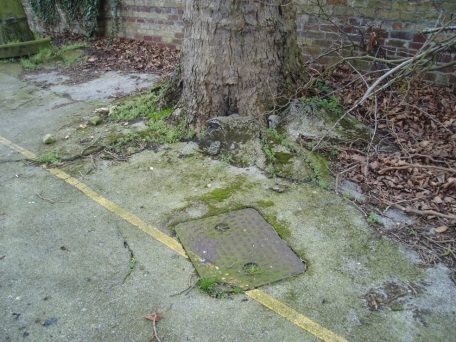 Because the Education Authority were aware many years before 1982 that they were moving the school to new premises little or no repair and maintenance work was carried out. This meant that when the Management Committee took ove the property in 1984 the list of repairs necessary was horrendous and little money was available to do anything structually. 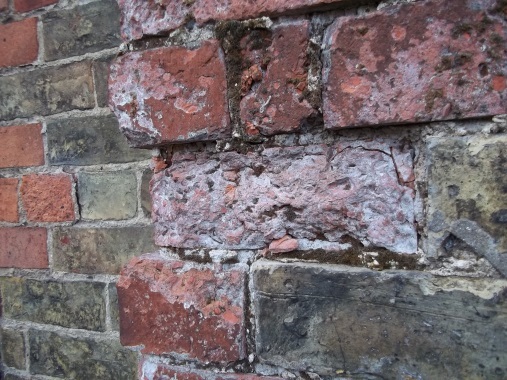 The metal guttering was leaking at every joint and allowing the water to enter via the lime and water morter of the brickwork. 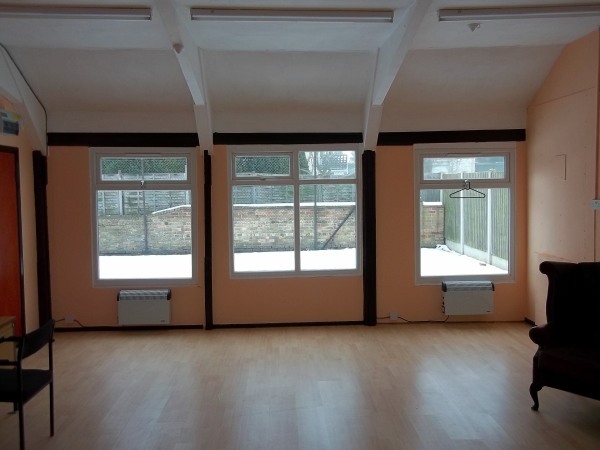 From the very beginning it was realised that a lot of work was needed to get the building in a shape so that it could be used as a community centre. With shortage of funds there were many things that was needed to be done but were unable to do. Initially all that could be done was to make it usable. 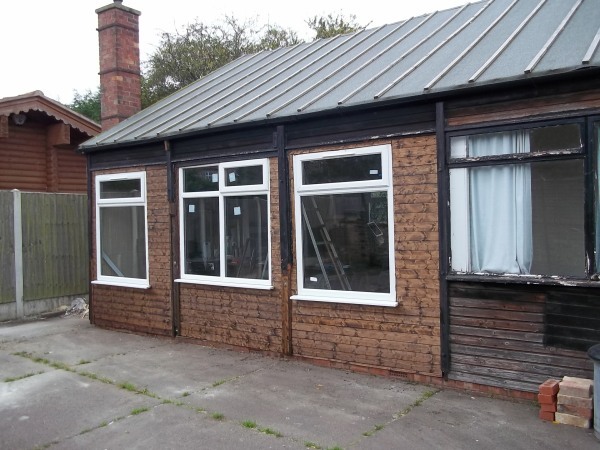 This entailed laying a new floor covering, fitting curtains and establishing a kitchen. Furniture was purchased and it was decorated internally. After about eight years the enthusiasm of the original committee began to wane and with only about £400 in the bank things looked bleak. The chipboard floor newly laid when the committee took over began to deteriorate and with more and more roof tiles being dislodged water was streaming down the walls every time it rained. A new committee was formed in 1990 and a concerted effort was made to seek capital funding for the renovation work needed. Many organisations were approached including the European Regional Development Fund (under Objective 5b) the Lincolnshire County Council and West Lindsey District Council. There were not many around before the National Lottery began in 1994. With a lot a hard work and time we managed to start getting enough funds to begin the work. This was mainly from the Lincolnshire County Councils’ Capital Grant Scheme who awarded us many grants of 50% of the costs. Under the agreement the West Lindsey District Council also contributed a further 16 2/3%. 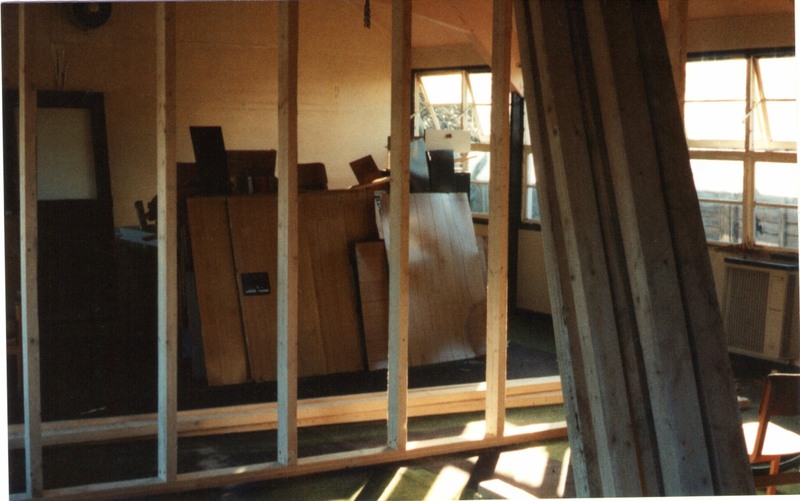 First, in 1990, with a LCC CGS grant for the replacement of the floor, the work being done by the Probation Service, we just had to pay for the materials as their time was free. 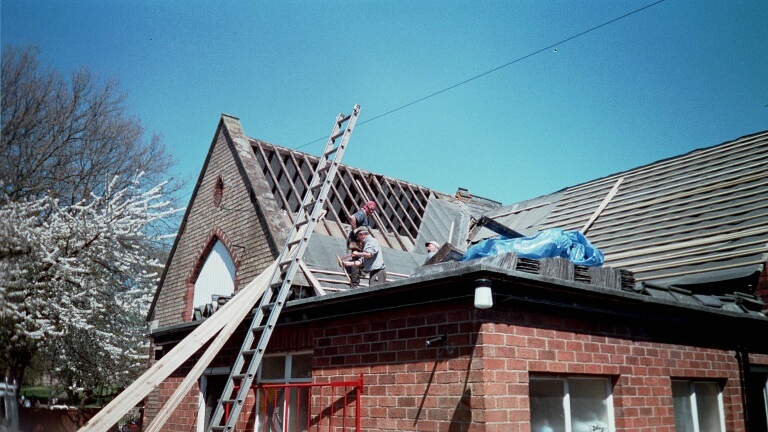 The next was of course the roof also with an LCC CGS grant. 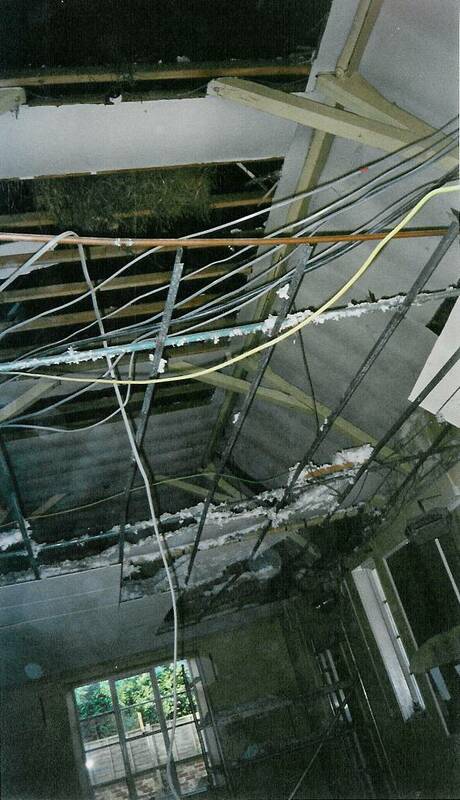 We did though have problems with the contractor for the roof. 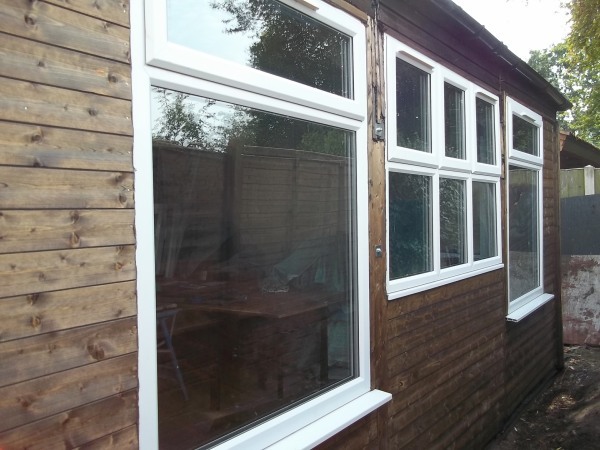 As normal we accepted the cheapest quote and unfortunately got a very poor quality job. 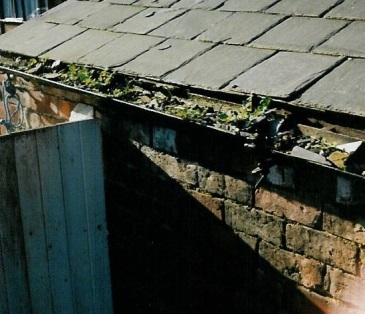 They were unaware of the problems in dealing with a slate roof on an old Victorian building. 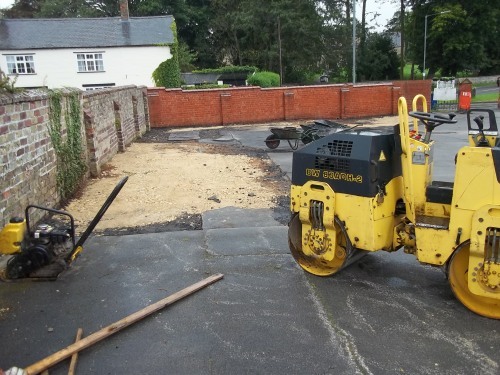 It took them over a year to complete the work due mainly because they spent at first days then weeks without doing any work at all and it still wasn’t completely finished when we took legal advice and paid them off to finish the work ourselves. During their work they caused the false ceiling to collapse when all the plaster fell inside due to their hammering and some of the old slates should not have been reused and some of the guttering was missing. No scaffolding was used throughout the work and they didn’t realise that slates are graded in thickness and weight with the thickest at the bottom with the lightest at the top of the roof. When they took the old ones off no care was taken on storing them separately consequently those that they reused were all mix up resulting in gaps all over the roof when they were re-laid. After threatening legal action they did remove all the slates and re-laid them on the elevation with new Spanish slates and using what they considered the best of the old at the rear. You can see by the unevenness of the ridge tiles that no particular care was taken in doing a satisfactory job. After the false ceiling came down we decided that it would be better and probably cheaper to remove it all and opened up to the rafters boarding it over the old plaster laths. The slate roof really needs redoing although it doesn’t leak like it did. Further grants came from the police to install dawn to dusk security lighting but we tried to cover all our costs from our own revenue. Starting work on replacing the felt and slate tiles on the roof. No scaffolding was used but they did have a ladder and managed to break the skylight in the toilet block roof on the first day. The roof has been compltely re-tiled and the contractors have remove all traces of the suspended ceiling and boarded it out. We didn't intend to do this but it does look better. After the Adult education had ceased to use the Annex it deteriorated very quickly as it was well past its useful life. 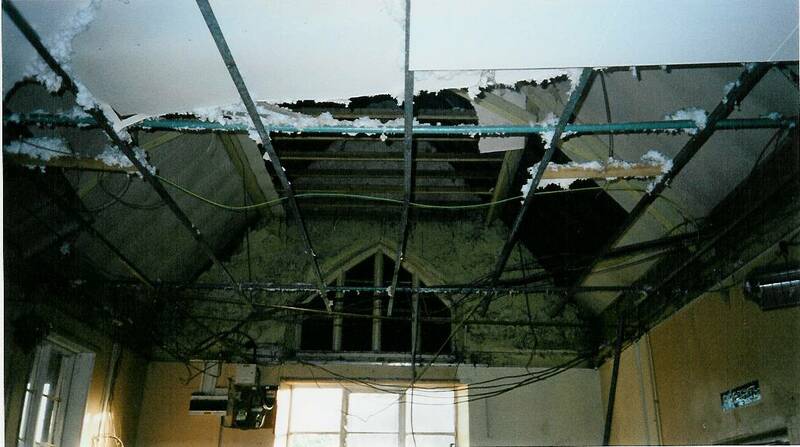 The walls were collapsing with the window frames falling out and the felt roof had huge holes in it. 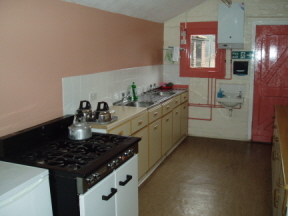 The only heating had been large gas heaters but was now condemned as unsafe. So with a further LCC grant the felt roof was from Lincoln and thought that one of our old lectures rooms was what they were looking for. 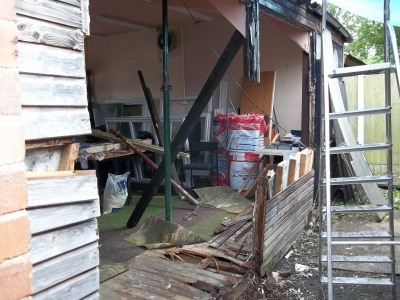 The result was that we went about renovating the whole building bit by bit on a self-help basis. Starting with the lecture room we removed all the window frames and installed uPVC windows with additional insulation. Fitted electric heaters requiring an addition 50 amp electrical supply to be installed and decorated throughout. 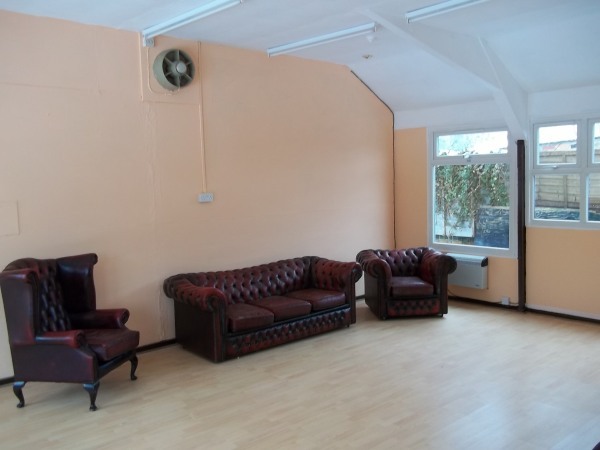 We did the same for the second old classroom with another 50amp electrical supply for the use of a local self-employed photographer as a studio. 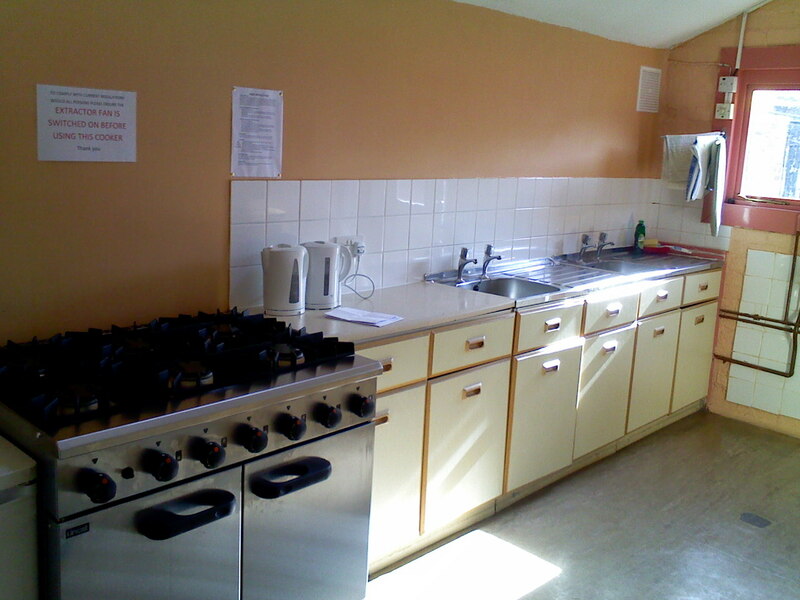 Then an updated kitchen was installed for them both. When the management Committee first took over the property the first thing they needed was users. 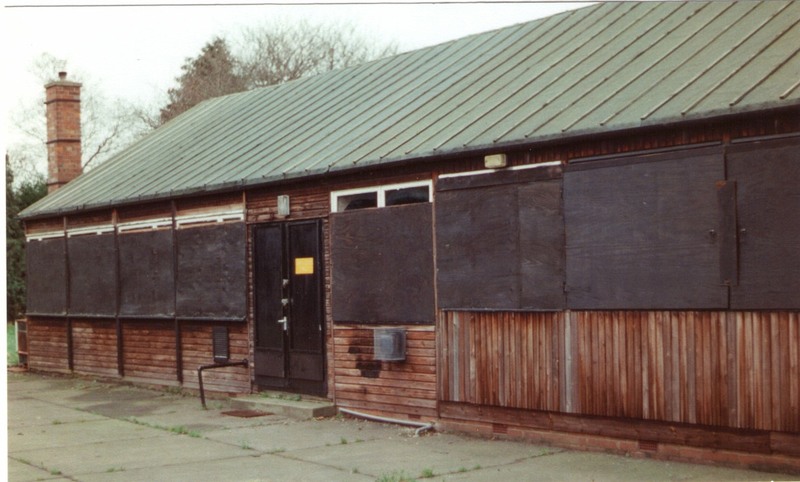 They eventually found one for the external annex when it was used as a snooker club. This entailed all the windows being boarded up internally and externally. 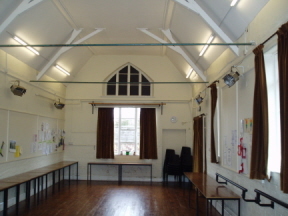 The Annex was used as additional classrooms but only had two rooms and a store cupboard. This suited the snooker club but when they closed in about 1994 it was decided to start renovationg it. To make the most of the space a stud wall was errected to make three rooms. Being an all-wood structure the annex had been deteriorating for years. The window framed were rotten to a point of falling out allowing the roof to sag. 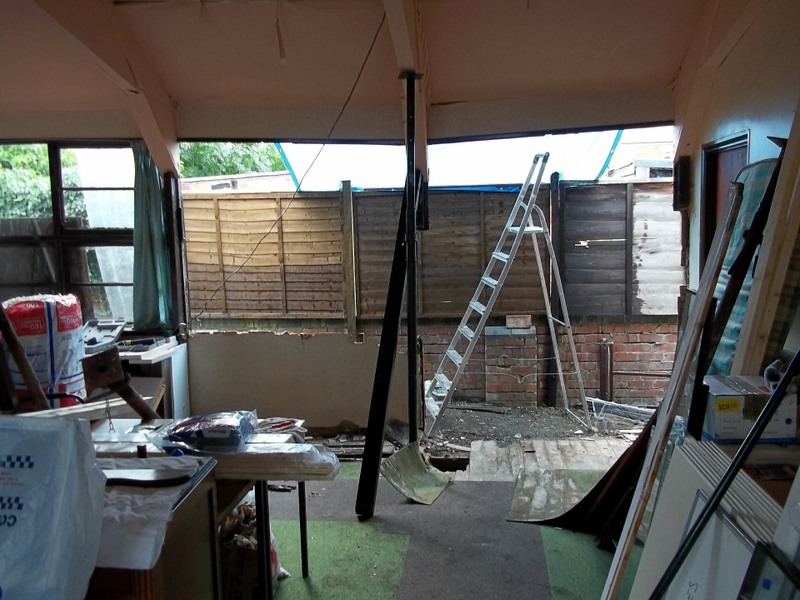 It required the support of a steel prop and the removal of the complete side before winding the prop up to raise the roof before new stud work was carried out to replace the wall. Not only were the walls falling out but there wasn't any damproof coars under the florring timbers on the brick foundation. this resulted in the floor timbers roting as well. The southern end of the annex is now completed with new stud walls with four inches of insulation and external cladding. 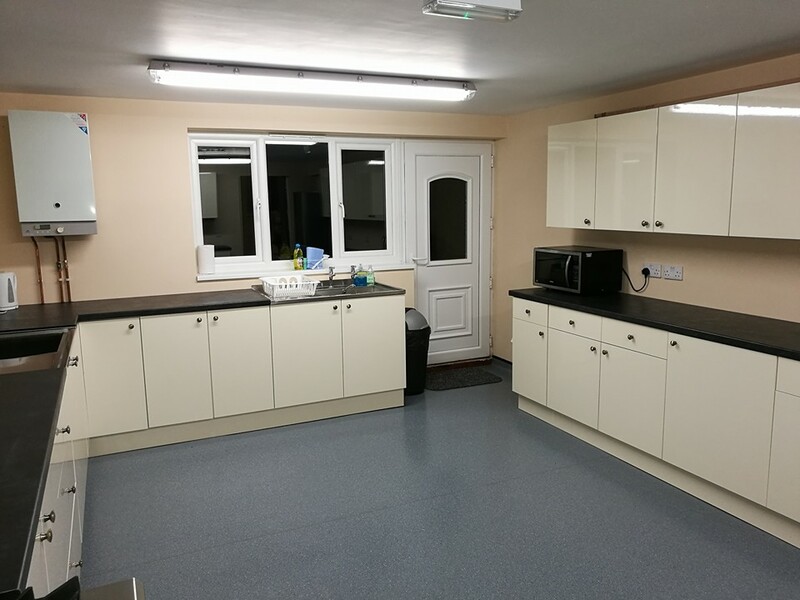 A laminate floor has been laid and electric heaters fitted. becomes available. 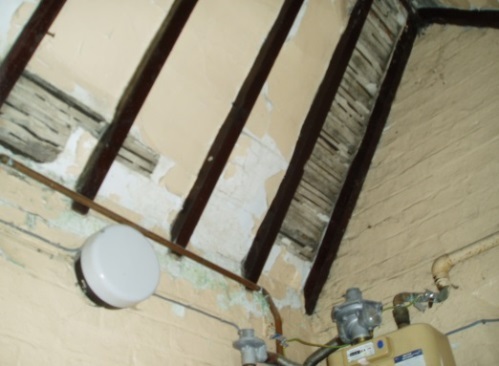 We have already planned for the flat roof of the toilet block to be re-laid, the skylight replaced and the toilet ceiling to be removed and re boarded with cavity insulation. 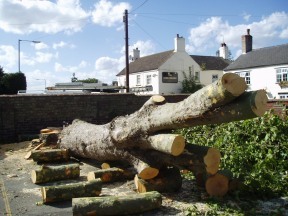 Because the trees at the front of the property was causing damage they had to be removed. This also opened out the view from the Old School and at the same time lowed the light in. 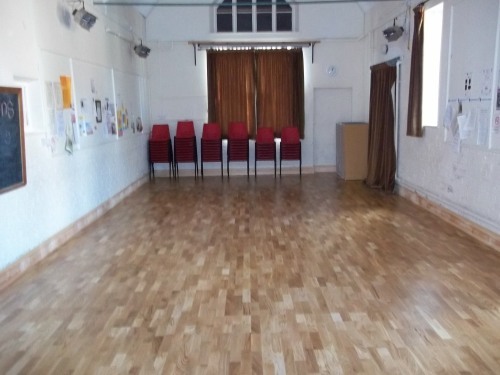 In 2015 when the Old School Committee became a Charitable Incorporated organisation the new trustees decided that a determined effort to seek grants to continue the future renovation and restoration work. 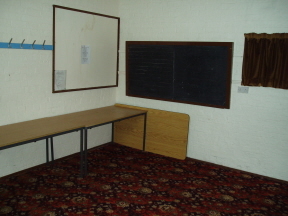 Then in 2017 we had the committee room renovated by installing a new ceiling and plaster-boarding throughout, decorated with new carpet flooring. This was done by a grant from IGAS of £2,500. At the beginning of 2018 another priority was the renovation of the toilets as the layout was the same as when it was a school. In the meantime the wall to the west was leaning quite conserable to a point of being dangerouse The trustees decided to to do this work themselves. Above is the view of the old school from the rear yard with the kitchen on the right. This is the same view after the ronovation work has been completed.